As promised, Choir! Choir! Choir! 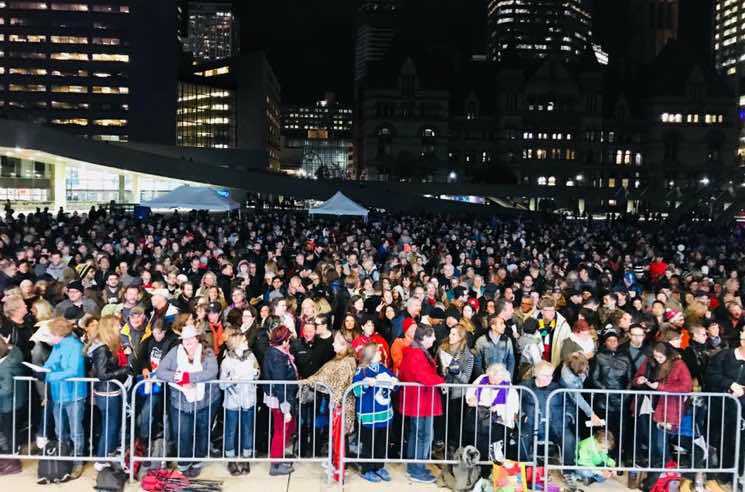 led Tragically Hip fans in Toronto through a touching singalong tribute last night (October 24) — but if you weren't able to attend, you can relive the event through the magic of Facebook video. The gathering took place at Nathan Phillips Square, and hundreds turned up to pay homage to the late Gord Downie. The Toronto ensemble led the massive crowd through favourites like "Ahead by a Century," "Bobcaygeon," "Courage" and "Poets." The group also performed Downie's Secret Path track "The Stranger," which was particularly fitting as the event was collecting donations for the Gord Downie & Chanie Wenjack Fund. Watch a recording of the entire singalong below via Choir! Choir! Choir! 's Facebook page. As previously reported, Downie passed away last Wednesday (October 18) at the age of 53, following a highly publicized battle with brain cancer. Dive into Downie's storied discography by ordering the complete Tragically Hip vinyl collection and the deluxe edition of Downie's 2016 solo album Secret Path via MusicVaultz.